Larger wakes reinforced by more traffic and reflective bulkheads of the "wide canals"
If you need to communicate with a large ferry, commercial vessel or yacht, you can use the following map. Note that smaller vessels may not be shown and the position, speed and direction of the vessel may be 5 - 10 minutes old. Use the controls in the upper left corner to zoom in or out and to pan around the map. Click on a vessel to obtain its name, speed, course, etc. You also remember that the vessel may take a half-mile to a mile to slow to a stop and that the vessel may be slow in changing direction. Give way and make your change in direction drastic enough so that the pilot or helmsman of the large commercial vessel understands that you've gotten out of his way. The GOLDEN RULE in NY Harbor: Assume a commercial vessel is restricted in its ability to maneuver and YOU GIVE WAY EARLY. Same situation, except you didn't give way soon enough and you hear one short horn blast or two short horn blasts from the vessel. Same situation, except you hear 5 short horn blasts from the vessel. This is a danger signal or the vessel's pilot or helmsman does not understand your intentions. Get out of the way ASAP and contact the vessel on VHF 13 if necessary. However, most ferries still run their routes fast point-to-point (contrary to NYS law prohibiting speed greater than 5MPH within 100' of a pier and NJS law requiring slow speed within 200' of a pier) and you'd be wise to have a lookout, have all persons off the foredeck and be ready to communicate on VHF Channel 13. Use the controls in the upper left corner to zoom in or out and to pan around the map. Click on the ship icons for more information. You should be aware of areas of concern such as marinas, boathouses, launching ramps, and poor visibility areas. 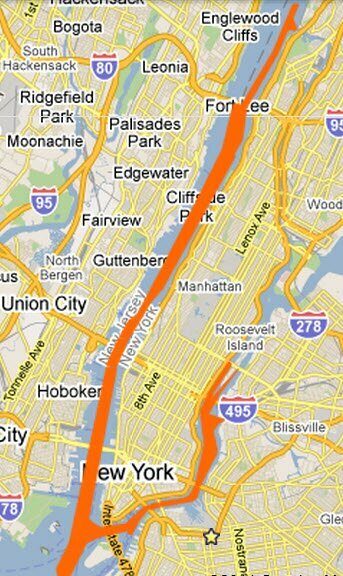 Also, on this route there are no wake zones of 200' off New Jersey pier heads and 100' off New York pier heads. 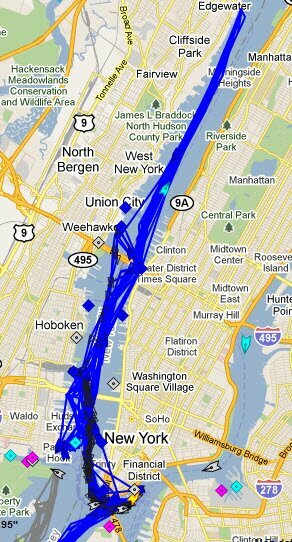 In NY Harbor there are kayaks, canoes, rowboats, outriggers and dragon boats either running singly or in small flotillas. These HPVs run off the pier heads but you should be alert for river crossings and heavy activity around their boathouses and launches. At night, some kayaks display confusing "identifying" lights of various combinations, e.g., a green light on the bow and a red light on the stern, rather than regulation-required lights.